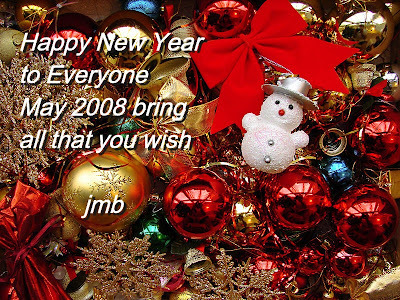 And so ends 2007, the year in which I started this blog and made so many wonderful new friends out there in cyberspace. You have all enriched my life in so many ways. You’ve challenged my mind with your posts, you’ve helped me with my tech problems, you’ve taught me so much about your different worlds, you’ve entertained me with your humour. Some of you have shared your poetry and stories and your beautiful paintings and photographs. You’ve welcomed me into your lives and shared your innermost thoughts and I am grateful to each and every one of you. I wish you all health, happiness and prosperity for 2008 and being half Scottish, I’ll close with the words of Rabbie Burns in Auld Lang Syne and make a toast (non-alcoholic, of course) to you all. or for the linguistically challenged English speakersAnd there is a hand, my trusty friend!